I’ve never been great at keeping secrets, and when I find something amazing – I love to shout it to the world, my boyfriend even says to me sshhhhh don’t tell everyone. 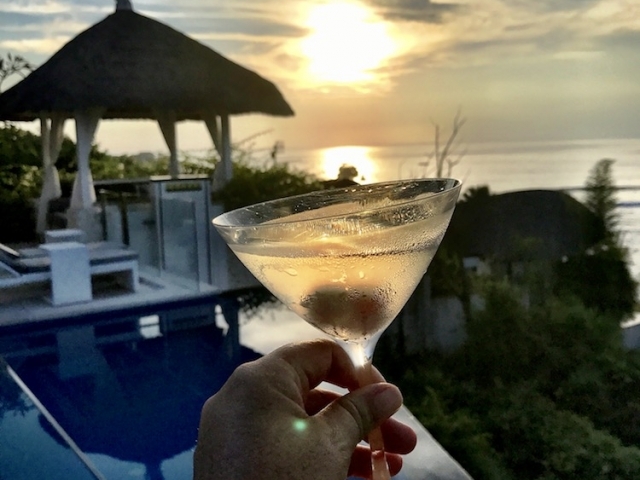 Well Lembongan lovers I have got a secret for you, thanks to the Lembongan Traveller, I just discovered the most AMAZING, STUNNING, GORGEOUS villa on the island – Rumah Putih. 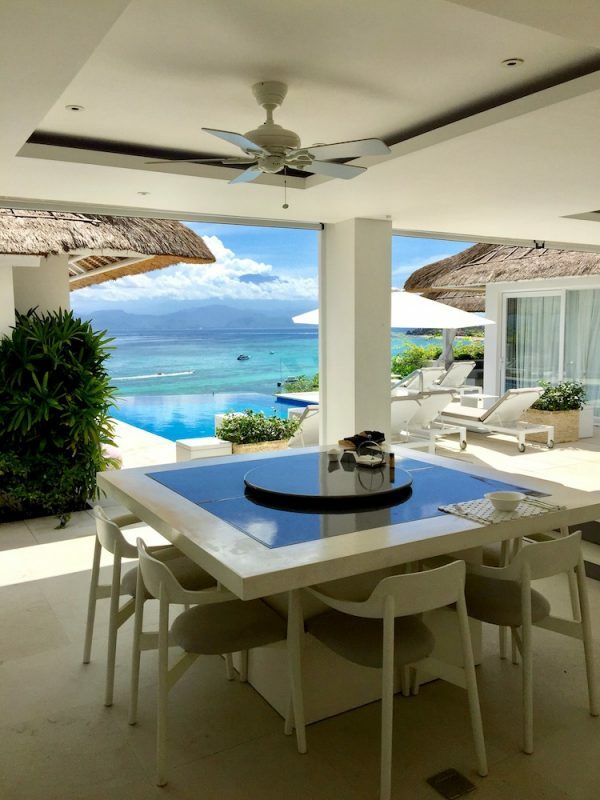 Perched high on the hill overlooking coconuts beach Villa Rumah Putih (translation= White House) oozes island luxe. 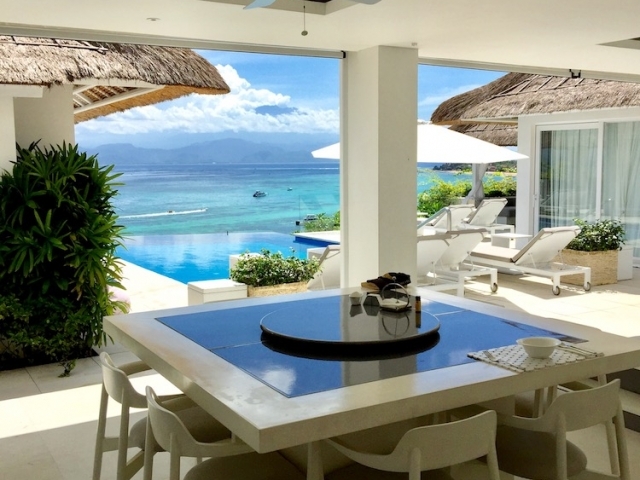 White on white modern interiors, with 50 shades of blue views, this stunning property is a little bit Hamptons, a tad bit Maldives and a lot of Mykonos. The moment I walked through the white wooden panelled door, I fell completely in love with everything in this place, its all and more that I adore about island holidays. 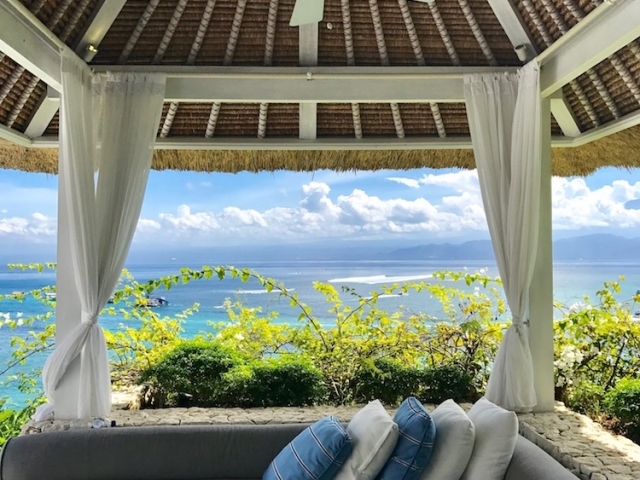 Rumah Putih is split level meaning every single inch of this villa takes full advantages of the stunning sparkling views of Lembongan bay. The ground level showcases a whiter than white kitchen, a gorgeous open air living and dining area, a large air-conditioned cinema room (yep you read right, a cinema room), a deep blue beautiful infinity pool surrounded by sun loungers and 2 perfectly placed bale’s where you can lay, read and snooze. And of course there are 2 deluxe and dreamy bedrooms both overlooking the water and both with enormous ensuites, featuring large bathtubs, double vanity, ample drawers and closet space to hang your Camilla kaftans. The upper levels feature 2 additional beautiful bedrooms, ensuites, outside showers and separating the two is a generously sized plunge pool! 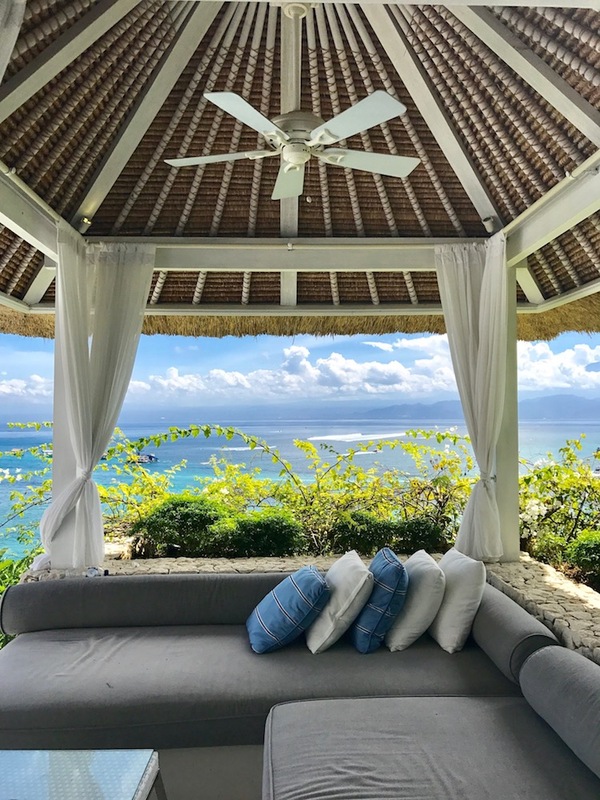 The sunset sundeck overlooks everything and is the perfect place to take in the breathtaking views surrounding this gorgeous villa. 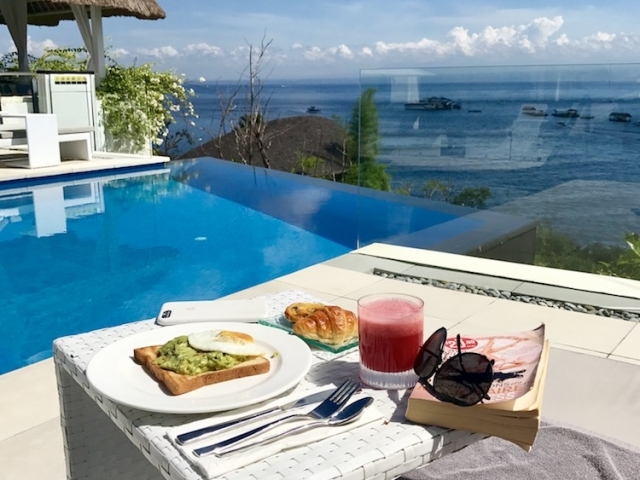 Rumah Putih literally has all you would expect in a luxury villa, and I mean it has it all, from waffle weave bath gowns, beautiful bath products, hairdryers, a wine fridge, an icemaker but best of all four-gorgeous helpful staff to assist with everything. 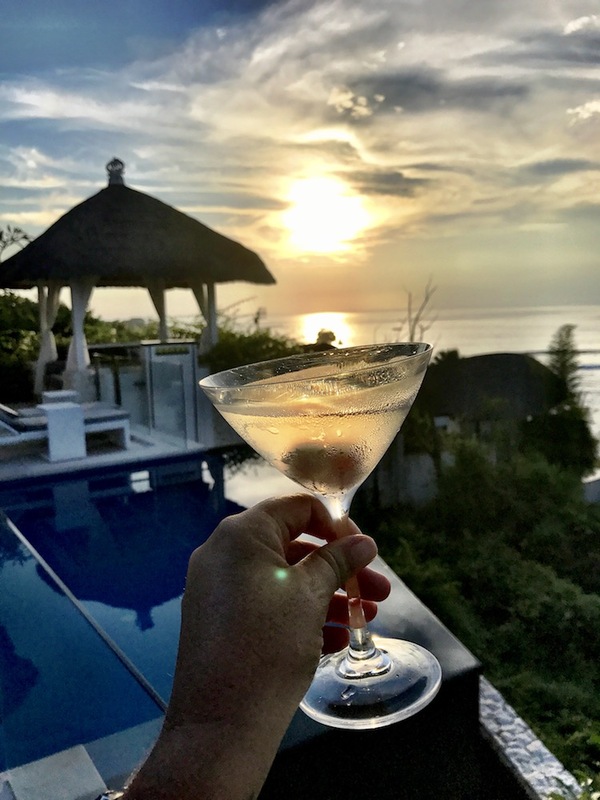 I need to tell you another secret….. they make the tastiest nasi gorgeng and can mix a lychee martini better than the bartenders at kudeta. 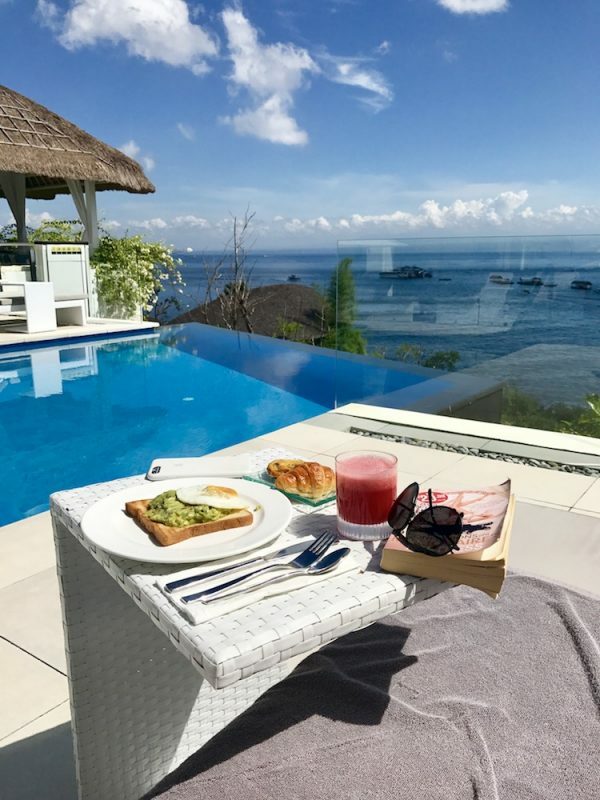 I can honestly say I found my perfect match when it comes to somewhere to stay on Lembongan – Rumah Putih is the ultimate island villa.